The Exo Terra terrarium is without doubt the most important aspect of successful reptile and amphibian keeping. Many species have different requirements, so a versatile and easy adaptable terrarium is essential. 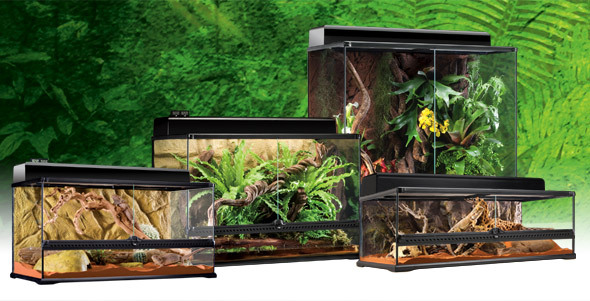 In order to meet the needs of our customers and more importantly, the needs of reptiles and amphibians, Exo Terra developed a wide range of terrariums each with their own specific features. All our terrariums can be used for several applications and set-ups; from temporary housing to the state-of-the-art natural terrarium. Thanks to Exo Terra’s natural approach, the terrarium hobby has evolved tremendously over the past few years. We turned a reptile “cage” into a “terrarium”! All Exo Terra products and components have been designed to work together, helping you to create and establish a harmonized natural-looking microhabitat. By combining the right products, Exo Terra makes it possible to cater to almost any species from almost any specialized habitat. The trend towards more realistic and naturalistic terrarium landscapes has made reptile and amphibian keeping more exciting and satisfying than ever. This new dimension has created, not only an opportunity for us all to educate ourselves about the natural conditions in which reptiles and amphibians live, but has also provided a whole new perspective as well. Simulating natural habitats enable us to enjoy that little piece of amazing wilderness in our own homes.